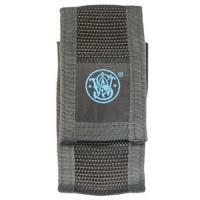 Protect and carry your S&W pepper spray safely with the Smith and Wesson SWP-1300H Special Nylon Holster. Smith & Wesson's holster will fit the SWP-1300 pepper sprays in 2 ounce sizes. This holder features a belt loop with Velcro closure to secure the spray. Wear your spray on your belt and have it within easy reach when you need it. Made of sturdy nylon, this Smith & Wesson SWP-1300H pepper case is proudly made in the United States of America and comes with a 1 year limited warranty. Fits SWP-1300 pepper spray 2 oz.